Contemporary art and contemporary art environment is very young term in Georgia. In 2004, as i returned from Germany to Georgia, the situation i found was very difficult in terms of there was no public present of contemporary art scene in Georgia. All the active artist were working in their ateliers and there was no communication taking place in the general public. 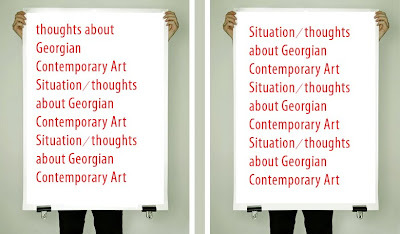 There are several problems, which are reciprocal and accumulate a general situation which we face today in Georgia's art scene. The Lack of good education. The system at the state art academy is very conservative and totalitarian. The teachers from older generation simply do not have the knowledge of contemporary art discourse which takes place in western or world art market to transfer it to students. And there is no openness towards teaching staff from young generation and IF they are allowed to teach, they are very restricted or limited in their methods. It should be mentioned right here, that the wrong religious education of the society plays very important role in the educational system, most of the western values are understood as unethical. As alternative to academic education there is just Internet which offers information about developments in contemporary art world. Next problem is bound on presentation opportunities: there is no institution in Georgia representing contemporary art. There are state galleries representing cultural heritage and art until 1970ies 80ies. Most of the galleries which consider themselves as contemporary are showing art works which are produced indeed now, but are absolutely not contemporary in their realization and thematic. Aligned with education it should be mentioned here, that there are no professional gallerists and curators in Georgia, in the soviet time and educational system the only faculty related to theory of art was art history, not even art criticism, there was no notion of art management and curatorial practice. this leads again to the problems of present practice, contemporary art exhibitions taking place lack of theoretical and thematic background. One should also admit, that there have been several attempts to change the given situation, - MAF (media art farm), which was a school concentrated and educating student in new media (photo, video..) existed from 2000 to 2006. They also organized 2 international contemporary art exhibitions APPENDIX. - GeoAIR (2003 onwards) organizes and supports international exchange projects with the goal of strengthening the Georgian and Caucasian art world, bringing together artists from different cultural backgrounds and finding relevant contexts for them to work in. 2007 GeoAIR started a project 'Archidrome' Contemporary Art Archive, which serves as a presentation room where regular meetings, discussions and presentations take place. We invite local as well as foreign artist for presentations and lectures that concern the cultural events in the region. It is about making a place where people can come and see creations, knowledge, experience and ideas that originate or are to be found in the Caucasus. It is like opening a window that gives you the opportunity to look into this field. 2010 GeoAIR starts its residency program. The GeoAIR residency program is a self directed residency program, that offers primarily curators and cultural producers the opportunity to base themselves in Tbilisi and use this location as a starting point to build networks, meet artists, cultural institutions and curators from the Caucasus region, and develop and deepen their knowledge and research of the Caucasus context. There is no pre-programmed residency available in Tbilisi (there are art pensions for artists), and very rear opportunities for curators and theoreticians to work in and about Georgia and Caucasus. It is important to stress that our residency program is emphasizing a collaborative process with institutions, organizations and culture producers from the Caucasus region to strengthen and extend the artistic foundation of this area and to encourage and stimulate the exchange of knowledge and the production of significant cultural projects on long-term basis. There are several curators, interested in Georgian art scene, supporting it and contributing to its development, Daniel Bauman is organising since 2004 international art projects called Tbilisi. 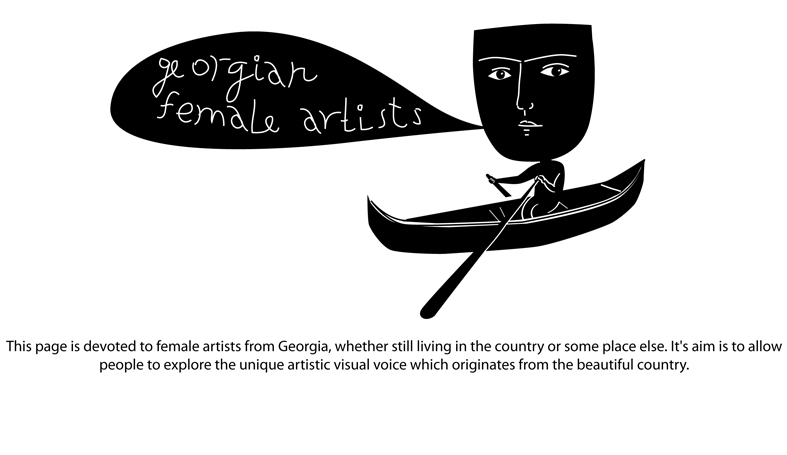 Also Goethe Institute and British Council in Georgia are supporting exchange between contemporary artist from and to Georgia very much. One should also stress, that the situation described above is illustrative just for Tbilisi, in regions it is much worse. The interest from the young generation is present, but the chance to develop it is still not provided. studying abroad. Hopefully the situation will change in next close future.